If you have forgotten your WorxHub password and have a valid email address, you can request a temporary password which will allow you successfully login to TheWorxHub. From the login page, click Forgot your password? Enter your email address and click Reset. Check your email. 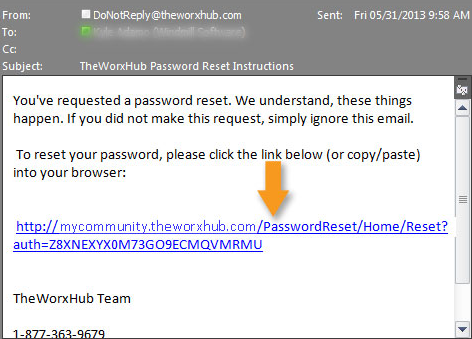 TheWorxHub will send you an email with a password reset link. If you don't see the email in a few minutes, be sure to check your Junk or Spam folder in case the email ended up there. Simply click the unique link in the email to set your new password. If the link does not work; highlight it, right click your mouse, and click Copy. In a new internet browser window, right click your mouse to Paste the copied url into the web address field. A page loads allowing you to specify a new password. Once you've typed your new password and confirmed it, click the Reset button to save your new password.